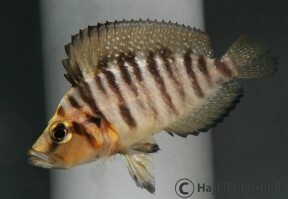 A. calvus 'Congo black pearl' displaying neutral colour pattern. A. calvus 'Congo black pearl' displaying aggressive colour pattern. Juvenile of A. calvus 'Congo black pearl' at 20 mm TL. Subadult specimen of A. calvus 'yellow'. Adult specimen of A. calvus 'yellow'. Exclusively found in rocky habitats around the shores and islands of the lake. This fish should be housed in a Lake Tanganyika biotope setup, with piles of rocks arranged to form caves filling much of the aquarium. Dim lighting will encourage it to be seen more often. 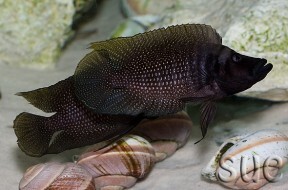 The black form (see below) will exhibit its stunning colouration much better over a dark substrate. Most meaty live and frozen foods are readily accepted. It won’t usually take dried varieties. Although territorial, it’s generally peaceful towards fish it can’t fit into its mouth, and is a good addition to a Tanganyikan community. 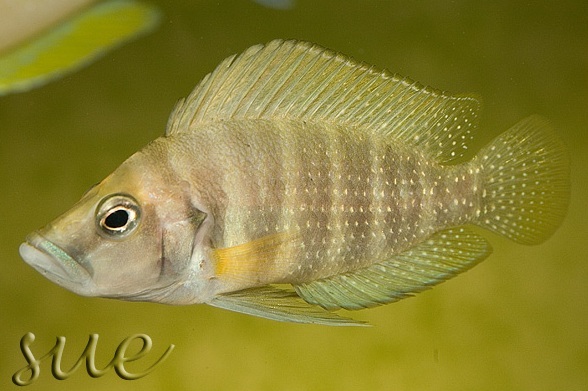 However it tends to be quite shy, so aggressive or very vigorous tankmates such as Mbuna should be avoided. Good choices include Julidochromis, Neolamprologus, Cyprichromis and Tanganyikan Synodontis catfish. It can be maintained either as a pair or as a colony in a suitably sized tank. Males grow larger and have longer fins than females. Possible. Substrate spawner. 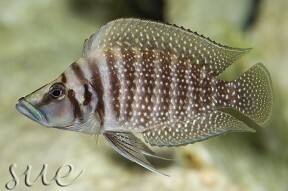 It may breed in the community aquarium but if you want to raise a full brood of these, a separate aquarium should be used. Set this up as any other Tanganyikan tank, using piles of rocks to form caves and crevices. Flowerpots or shells can also be used to create the desired effect. Water should be hard and alkaline with a pH of around 8.0-8.5 and a temperature of 77-80°F. The best way of obtaining a pair is to buy a group of juveniles and let them pair off naturally. Unfortunately this may take as long as 2 years depending on the age of the fish. 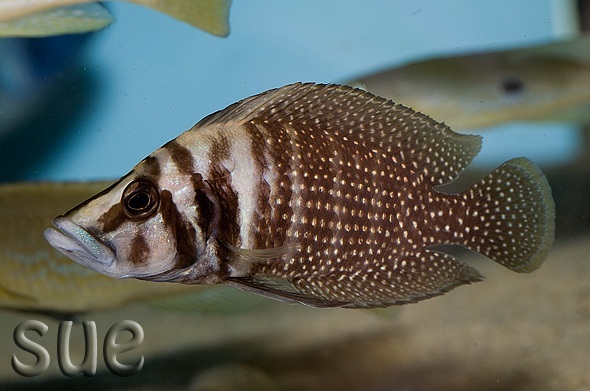 Calvus can also be bred in a harem with 3 or 4 females and a single male. In either case, the fish should be conditioned on a varied diet of live and frozen foods. 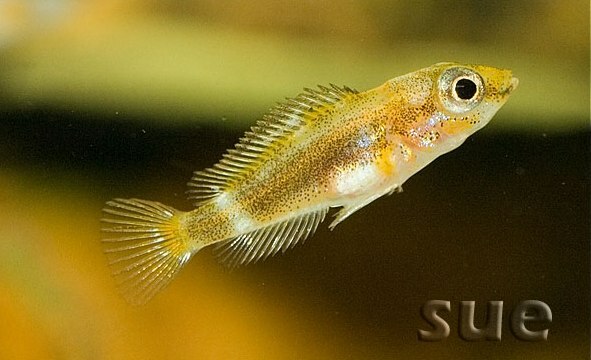 It breeds in a similar fashion to South American Apistogramma species.The female will select a cave into which only she can fit and the male deposits his sperm at the entrance to this. The pair then use their fins to fan the sperm towards the eggs that she has already laid on the substrate inside the cave. These may number up to 200 and are tended to by the female, while the male guards the area outside the cave. They hatch in around 2 days and become free swimming after another 8-10 days. Once the eggs have hatched, the male should be removed as he may predate on the fry when they become free swimming. The female does not usually harm them. The fry can be fed brine shrimp nauplii and microworm from the first day, and grow very slowly. They should be observed closely and separated as differences in growth rates become apparent as the larger fry may prey on the smaller. 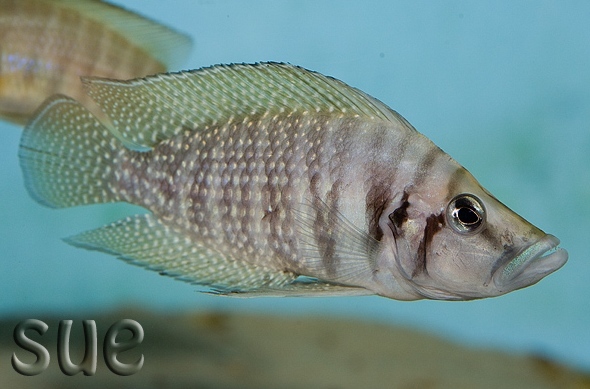 A. calvus is a predator by nature and its body shape has been adapted to allow it to enter small crevices and gaps in the rockwork of Lake Tanganyika to prey on eggs, fry and small fish. Its laterally compressed shape makes the fish hard to spot head on, giving it an advantage over would be predators and prey alike. It is also quite well-armoured, possessing thick scales which can be turned towards potential attackers. These can cause real damage with their serrated edges. Several colour forms from different areas in the lake are regularly available, with the black, white and yellow forms being particularly popular. These morphs should not be allowed to hybridise, therefore they should not be kept together. This species is distinguishable from its only congener, A. compressiceps by the profile of the mouth, which is sloped more laterally in this species than in compressiceps. It also has a scaleless area on the head that gives rise to the species name, ‘calvus‘ being the latin word for bald! This isn’t really a good beginner’s fish, as it’s sensitive to changes in water chemistry, particularly when first imported. 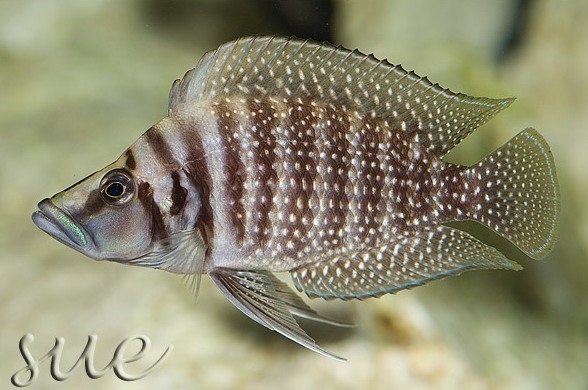 Tank-bred fish tend to be hardier but sudden changes in water parameters or temperature should still be avoided.